Phuong D. Nguyen, MD, is an attending surgeon in the Division of Plastic and Reconstructive Surgery at The Children's Hospital of Philadelphia. 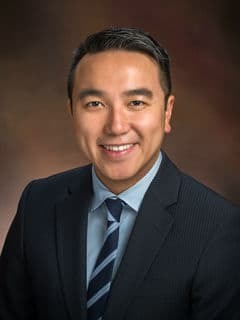 Dr. Nguyen primarily is interested in all aspects of pediatric plastic surgery, with a practice focusing on facial palsy, facial trauma, vascular anomalies, microtia and ear anomalies, and congenital lesions. He has traveled internationally to learn additional innovative techniques from facial palsy expert Dr. Daniel Labbe and ear reconstruction expert Dr. Francoise Firmin. In addition, Dr. Nguyen has introduced a procedure to restore corneal sensation to children at CHOP, working in tandem with oculoplastic surgery. He is also highly engaged in both clinical and basic science research, having served a post-doctoral research fellowship at the Institute of Reconstructive and Plastic Surgery, with interest in tissue engineering, stem cell regeneration, and improving clinical outcomes in facial palsy, facial trauma, and vascular anomalies. He presents regularly at both national and international meetings. Dr. Nguyen is also highly active in international mission work, focusing on cleft lips and palates. He frequently volunteers with Operation Smile as well as other humanitarian organizations, and has traveled to Vietnam, Nepal, India, Peru, and Guatemala, amongst others. Dr. Nguyen primarily sees patients at CHOP and also has privileges at Penn Presbyterian Medical Center and the Hospital of University of Pennsylvania. Zhang Q.Z, Nguyen P.D., Xu Q., Park W., Lee S., Furuhashi A., Le A.D. Neural progenitor-like cells induced from human gingiva-derived mesenchymal stem cells regulate myelination Schwann cells in rat sciatic nerve regeneration. Stem Cells Transl Med. 2016 Sept.
Nguyen PD, Caro MC, Smith DM, Tompson B, Forrest CR, Phillips JH. Long-term orthognathic surgical outcomes in Treacher Collins patients. Journal of Plastic Reconstructive and Aesthetic Surgery. 2016 Mar; 69(3); 402-8. Isaac KV, Koenemann J, Fukasawa R, Qian D, Linhares A, Saber NR, Drake J, Nguyen PD, Forrest CR, Phillips JH. Optimization of cranio-orbital reshaping: application of a mathematical model. Journal of Craniofacial Surgery. July 2015. 26(5) e416-9. Nguyen P.D. “Congenital Hand”. Plastic Surgery Review. Ed: Lakin, G.E. Ch 39. 237-246. Thieme Publishing. 2015. Nguyen P.D., Cohen O.D., Nadler, E.P. “Arteriovenous Malformations”. Paediatric Surgery: A Comprehensive Text for Africa. Ed: Ameh et al. Ch 112. Spectrum Publishing. Global HELP. 2010. ISBN -13 #978-1-60189-091-7. Nguyen P.D., Smith D.M., Forrest C.R., Phillips J.H. “A virtual reality atlas of craniofacial pathology.” 16th International Society of Craniofacial Surgery. Tokyo, Japan. 2015, Sept 18. Nguyen P.D., Smith D.M., Forrest C.R., Phillips J.H. “Quantitative assessment in craniofacial surgery: an objective metric of global shape change.” 16th International Society of Craniofacial Surgery. Tokyo, Japan. 2015, Sept 18. Nguyen P.D., Smith D.M., Forrest C.R., Phillips J.H. “Comparison of CAD/CAM PEEK, HTR, and titanium implants for craniofacial reconstruction in children.” 16th International Society of Craniofacial Surgery. Tokyo, Japan. 2015, Sept 16. Nguyen P.D., Smith D.M., Clausen A., Shen C., Phillips J.H., Forrest C.R. “Comparison of two techniques for nonsyndromic sagittal craniosynostosis: morphological outcomes.” 16th International Society of Craniofacial Surgery. Tokyo, Japan. 2015, Sept 16. Nguyen P.D., Smith D.M., Forrest C.R., Phillips J.H. “Comparison of custom CAD/CAM polyetheretherketone versus titanium implants for craniofacial reconstruction in the pediatric population.”Computer Assisted Radiology and Surgery” 29th International Congress and Exhibition. Barcelona, Spain. 2015, June 27. Taub, B., Nguyen P.D., Jarrahy R. “Cultural awareness and screening in a global surgery setting.” Academic Surgical Congress, San Diego, CA. 2014, February 4. “Facial trauma: the plastic surgeon’s perspective.” Grand Rounds. Department of Surgery. Mercy Fitzgerald Hospital. Darby, PA. 2016, Oct 20. “Vascular anomalies: an update.” Grand Rounds. Department of Pediatrics. Delaware County Memorial Hospital. Drexel Hill, PA. 2016, Sept 8. “Ear deformities.” CHOP Talks CME Lecture Series. Brandywine Pediatrics. Wilmington, DE. 2016, Mar 8. “Vascular anomalies for the primary care physician.” Grand Rounds. Department of Pediatrics. Abington Memorial Hospital. Abington, PA, January 2016. “IV infiltrates and wound management – a plastic surgeon’s perspective.” CHOP Talks CME lecture Series. Virtua Voorhees Hospital. Voorhees, NJ, January 2016. “Vascular anomalies: hemangiomas and vascular malformations.” Grand Rounds. Department of Pediatrics. Crozer-Chester Medical Center. Upland, PA, November 2015. “Maxillary Hypoplasia in the Cleft Patient: Contribution of Dental Agenesis to Le Fort I Maxillary Advancement.” Longmire Society Research Symposium, UCLA, Los Angeles, CA, March 2014. “Cultural Awareness and Screening in a Global Surgery Setting.” Academic Surgical Congress, San Diego, CA, February 2014.